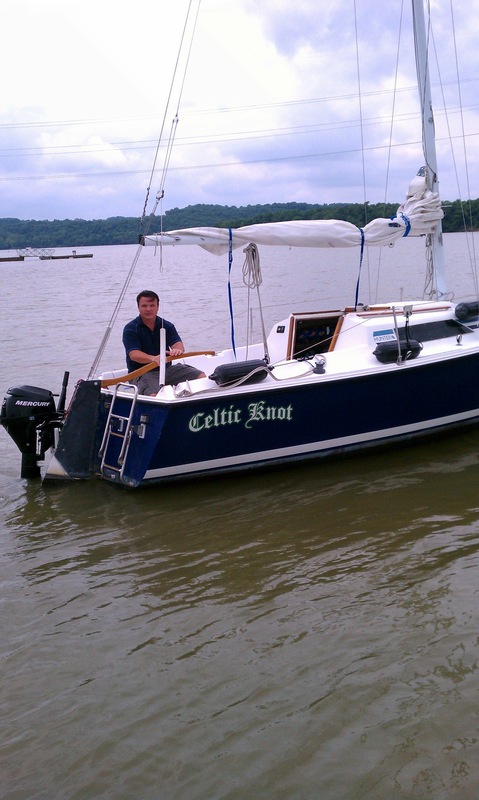 February 2015 – Interested in Learning How to Find, Select and Eventually Live On Board Your Own Sailboat? You're in the Right Place…. 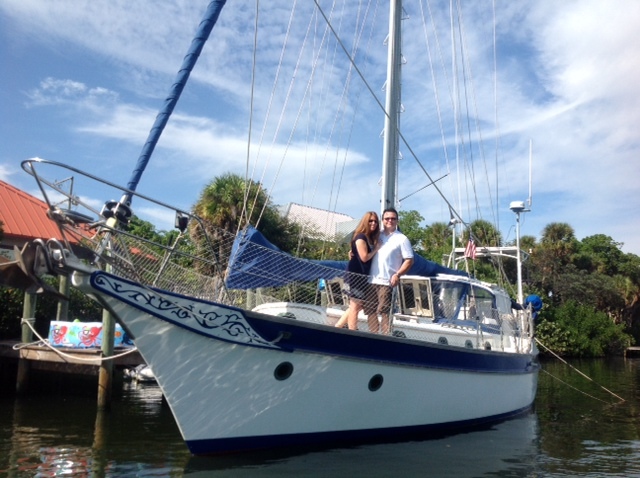 Our First Boat and Our Current Boat…. 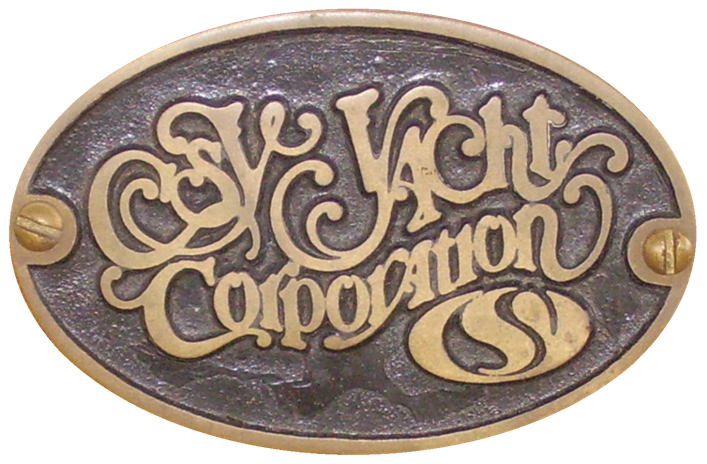 The original CSY Yacht Corporation Badge. These were affixed to the horizontal wood surface of the forward companionway hatch. 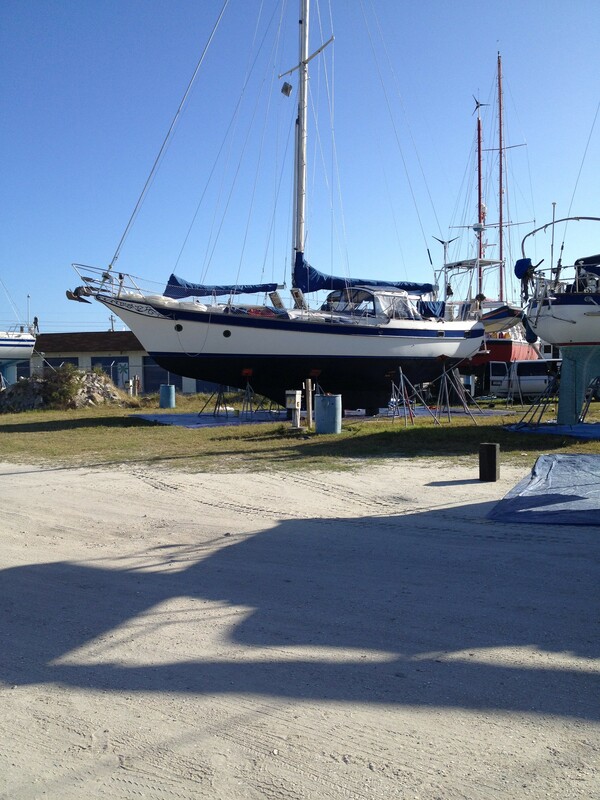 Our current “new to us” boat is a 1979 Caribbean Sailing Yacht…more commonly known as a CSY. Our particular boat is a “walkover” or mid-cockpit design. This means that the aft cabin is completely separate from the forward area and you walk up and through the cockpit to access the opposite area. We like it because it makes the cockpit more like the “living room area” although it does necessitate a willingness to travel seasonally to maintain the optimal usefulness of the cockpit area. Here’s a few images….and a few specs…. She’s 44′ LOA weighs in at a total of 44,000 pounds, is 36.33′ at the water line, drafts 4.8′, has a 13.33′ beam, is a cutter rig, has a fully encapsulated 14,000 pound lead ballast, has been re-powered with a 65hp Cummins 4B 3.3 Diesel, She has 100 gallons of fuel tankage, 400 gallons for water and has just over 900’sq of sail area.There have been a lot of modifications and improvements to Kitty Hawk since she was first launched in February of 1979. Notice the hard Bimini top, solar panels, wind generator, radar, the full enclosure and the arch at the stern…This was just after a fresh coat of bottom paint that I applied and was thrilled to save $1500 by doing it myself…. 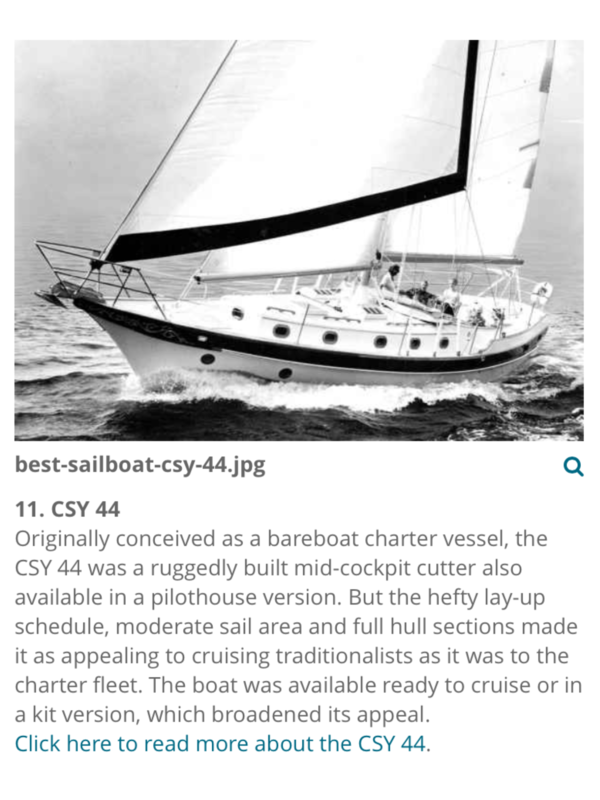 Posted on February 9, 2015 April 7, 2015 Categories About us, Experiences, Our boat, photosLeave a comment on Our First Boat and Our Current Boat…. We have, since the purchase of our most recent boat in December of 2013, logged about 1500nm just during seasonal movements of her. We have spent the last two winters in Florida and hurricane season in North Carolina. Our insurance requires us to be North of Cumberland Island, GA as of June 1 each year and to stay North of that point until November 1. Ironically, in 2014, NC was the only area of the Eastern U.S. to have a hurricane make landfall. This has made me seriously question the logic behind the time frame restrictions of that particular policy requirement. That storm was Hurricane Arthur and it arrived the week of July 4th. I got up on Tuesday morning and was watching the news when I saw the reports of the hurricane. I called my wife into the room and said “Well, I’m probably leaving for NC tomorrow morning”. We had been staying away from our boat and close to our family to assist with what we would later learn was a terminally ill relative. Arthur made landfall about 22 miles south of where our slip is located with 100mph winds. What an exhilarating way to test my hurricane preparation abilities for the first time!!! The good news is we had “0” damage. I stayed with some friends nearby during the storm but one of our slip neighbors who spent the night on their boat during the storm said they clocked winds at about 60mph in the marina. I was, needless to say, proud of my work and the lack of damage. I was also retroactively proud about the selection of the location for our slip. It is well protected up the Neuse river about 22 miles from the ocean and has a large hill across the creek to the East side that apparently does a great job blocking the wind. 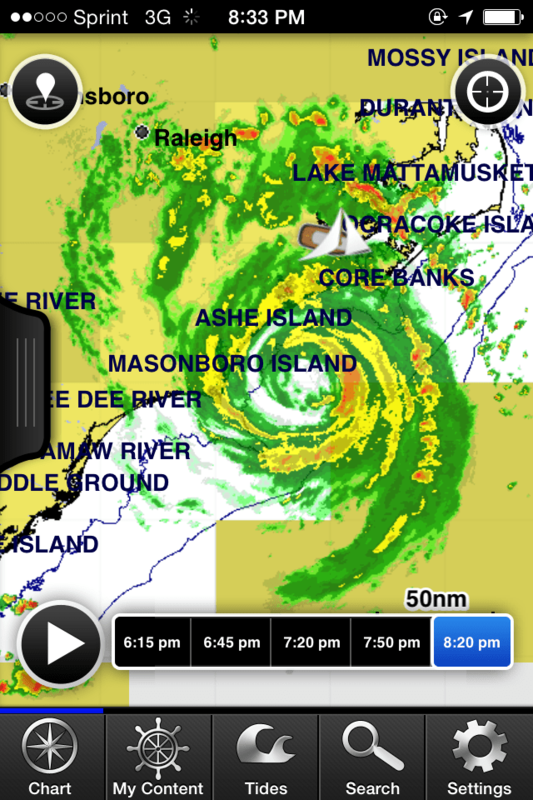 That’s the radar image of the Hurricane Arthur about to make landfall…that sailboat icon was us !!!! During our first move in May of 2014, I had three friends who accompanied me for the ten day voyage. My friends were of three types, one an avid and experienced sailor, one a very competent mechanic with sailing experience and one a fearless, mechanically competent newbie to sailing. I felt like I had all my bases covered with this crew and I was right. My wife, unfortunately, was stuck at work and sadly missed the maiden voyage. I’ll keep a long story short and say we had an absolute blast. While most of the days consisted of up at dawn and motoring in the ICW until nearly sundown, we managed one overnight offshore hop between Fernandina Beach and Port Royal, SC. Our evenings consisted of either great dinners on board (or ashore) and the obligatory, celebratory beverages. After all, there is something to celebrate every evening when traveling by sailboat, or any boat for that matter. We managed to only hit bottom three times during the entire trip along the ICW, two soft rubs that resulted in a tense second or two and one strike just North of the Ben Sawyer Bridge in SC that stopped us dead in the water, we bounced off the obstruction and managed to float around it to port without delay. I was understandably proud when my most experienced crew member said “If we were on my boat we’d be abandoning ship after that ! !” We just motored on…..There’s something to be said for structural strength…..
Our second move was in December of 2014. Now, I know they say to “never say never” but based on this last experience and with any luck I will NEVER move a boat South from NC that late in the year again. We will start much earlier and work our way South so we arrive in Florida on November 1 or I’ll bite the bullet, pay for winterizing, buy some very nice heaters and grudgingly ride it out. My boating and sailing preferences run much the way of my scuba diving preferences…warm water, warm air…and the warmer the better. This move was delayed by obligations to our ill relative and the scheduling of my friend to assist me. We spent several very cold days on board waiting for a gale to blow through in NC. I filled some time by cleaning hulls in the marina and making a few extra bucks. Once under way we both developed terrible head colds after Beaufort, NC. That made our first offshore hop from Cape Fear to Georgetown, SC a very bad, cold and rough experience. It was nice to see what our boat could handle though, she blasted through 12 hours of confused seas and 8′ swells without a creak or a leak !!! My friend who assisted on this trip was also on the prior trip North…(my most experienced sailing friend) whose favorite saying became “nice solid boat”. Based on this experience I understand why so many people hire delivery captains.